Feeling the chill in this cold snap of weather we are having lately? Consider making this roasted sweet potato and carrot soup – a healthy winter warmer you are sure to enjoy. Preheat your oven to 200°C. Peel the sweet potatoes and cut them into chunks. Peel the carrots and dice them. Add both of these to a large roasting tin and drizzle them with two tablespoons of olive oil. You can add some seasoning (salt and pepper) also at this stage if you wish. Roast these vegetables for 25 – 30 minutes, or until they are tender. Finely chop the onions and crush the two garlic cloves. Add one tablespoon of olive oil into a large and deep saucepan over a low – medium heat. When heated up, add the onions to the frying pan. When the onions have softened, add the garlic and stir for one minute. Add the vegetable stock and simmer for 5 – 10 minutes until the onions have softened – then turn the heat off. When the sweet potato and onions have finished roasting in the oven, remove them and leave them to cool a bit. Once ready, add them to the saucepan and use a hand blender to combine all of the ingredients together until smooth. Stir in most of the crème fraîche, add more seasoning (if desired to taste) and reheat in the saucepan until hot. Your roasted sweet potato and carrot soup is now ready! Serve it in bowls and add a swirl of crème fraîche and some black pepper if you would like – of course this is down to personal taste preference. Like this recipe? You are sure to find many more that you like on the Shape My Plan app (where this recipe comes from). 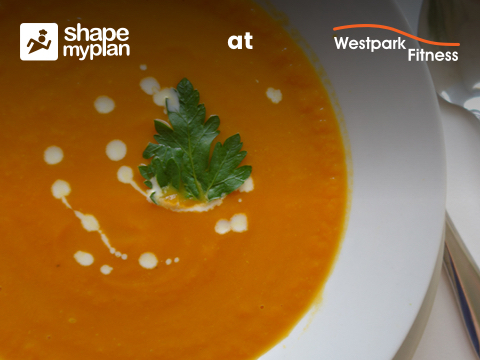 Filled with recipes, food information, tips, a nutritional tracker and more; Shape My Plan is available to Westpark Fitness members for €4 per month instead of usually being €12 per month! Not a member of Westpark Fitness yet? Click / Tap here to book a FREE tour of our facilities.